Kay Boyle was born in St. Paul, Minnesota, to a wealthy family that fell into poverty over time. She was educated at the Shipley School in Bryn Mawr, Pennsylvania, then studied architecture at the Ohio Mechanics Institute in Cincinnati. She also studied the violin at the Cincinnati Conservatory of Music before moving to New York City in 1922. There she worked as assistant to the American editor of Broom, a small literary journal. At age 19, she met and married Richard Brault, a French exchange student, and moved with him to France. She left Brault for Ernest Walsh, a poet and magazine editor with whom she had a daughter. Her second husband was Laurence Vail, a writer and artist with whom she had three more children. During her nearly 20 years in France, she befriended many writers and artists in the Montparnasse neighborhood of Paris, including Harry and Caresse Crosby, owners of the Black Sun Press, which published her first book of short stories. Her debut novel, Plagued by the Nightingale, appeared in 1931. She produced more than 40 books, including 14 novels, 11 volumes of short stories, eight books of poetry, four translations of French works, four children’s books, and five nonfiction books. Many of her short stories of the interwar years were published in The New Yorker. Her most famous work may be her memoir Being Geniuses Together: 1920-1930 (1968) in which she interwove the story of fellow expatriate writer Robert McAlmon’s with that of her own. In later years, she taught creative writing courses at various universities. She was active in left-wing politics all her life, and after returning to the USA, she and her third husband Joseph von Franckenstein -- an Austrian aristocrat and Resistance hero of World War II who worked for the State Department -- lost their jobs during the McCarthy era. Both were later cleared by the State Department of any security risk. She also wrote for transition, one of the preeminent literary publications of the day but was blacklisted by most of the major magazines. In 1963, she took a creative writing position at San Francisco State College, where she remained until 1979. She participated in numerous anti-war protests, and in 1967 was arrested twice and imprisoned. She was elected to the American Academy of Arts and Letters in 1968 and won a lifetime achievement award from the National Endowment for the Arts. Kay Boyle is currently considered a "single author." If one or more works are by a distinct, homonymous authors, go ahead and split the author. 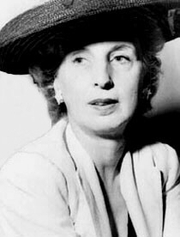 Kay Boyle is composed of 3 names. You can examine and separate out names.